We love frozen treats in the summer, and that includes ice cream cakes. I used to just purchase ice cream cakes because they seemed so hard to make. But now I have a foolproof way to make the best ice cream cake in no time. Once you get it down pat you are all set for having ice cream cakes all summer long. You can even make them with almost any kind of flavor combination. 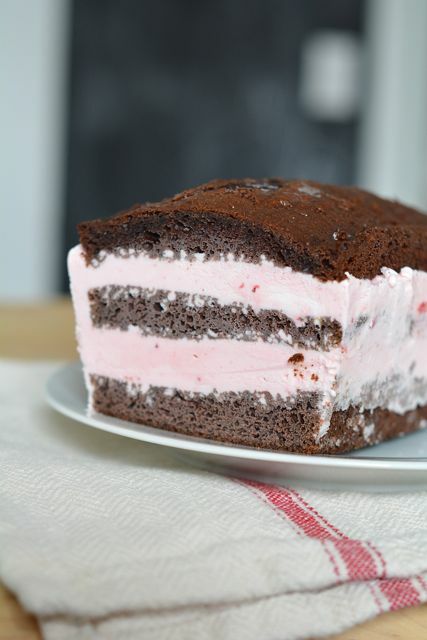 My kids chose this ice cream cake recipe with chocolate and strawberry ice cream. (I would’ve preferred mint chocolate chip ice cream!) We baked it all up together, and the dessert was totally delicious. We served it to all the kids we had over for a cookout last week, and it was ideal. Festive & easy, and there were no leftovers! Step 1: Preheat the oven to 350 degrees F. Spray two 9x5 loaf pans with cooking spray and set aside. Step 2: In a large mixing bowl, whisk the cake mix with the water, eggs, and oil until totally smooth. Then fill each loaf pan with equal amounts and bake for 45 to 50 minutes, or until a cake tester inserted into the center comes out clean. Let the cake cool in the pan for 10 minutes. Then invert it onto a rack to cool completely. Scrub out the cake pans, and dry them completely. Set aside. Step 3: Once a cake has cooled, slice it horizontally into three equal sized slices. 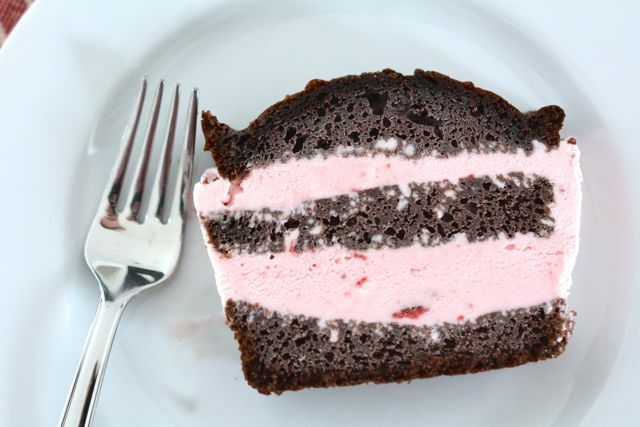 Place the bottom slice back in the bottom of a cake pan. Scoop one quarter of the ice cream on top of it and spread it evenly over the cake. Then, place the second slice on top and spread the remaining ice cream on top. Top with the last cake slice. Wrap the loaf pan lightly in plastic wrap and place it in the freezer to freeze for at least 12 hours. Repeat with second cake. Step 4: To serve, remove the pan from the freezer and run a knife warmed under hot water around the outside of the cake to loosen it. Invert it onto a plate. Slice and serve!